When it’s cold outside, we stay huddled up by the fire. We have hot cocoa, or maybe a splash of Irish cream in the coffee. For dinner, we make a spicy pot of chili, or sometimes a delicious curry. But our chickens? They aren’t able to cook up their own treats (since I haven’t equipped the coop with a kitchen—yet). So I often cook up some cold weather chicken treats for them. Prissy, like my other girls, loves to be spoiled. You’ll enjoy making cold weather treats for your flock. Want to make some cold weather treats for your flock? I’ll share three easy options right here. Combine everything but the optional ingredients in a saucepan; bring to a boil, then reduce heat and simmer until thickened. Stir in the optional ingredients, if you’re using them. In cold weather, chickens may need extra calories from high fat foods so their bodies have enough energy to maintain body temperature. Although it doesn’t have all the nutrition your birds require (in fact, mistaking cracked corn for regular, nutritionally balanced chicken feed is one of the worst mistakes a novice chicken keeper can make), still, corn is relatively high in calories because it has high-calorie oils, sugars and starches. Combine dry ingredients in a bowl. Combine wet ingredients in a separate bowl—then add to dry ingredients. Fill muffin tin about 2/3 full, and bake in preheated 400 degree oven for 15 – 18 minutes until done. Chunky Chicken Caviar, pictured here, is a great suet cake in cold weather. 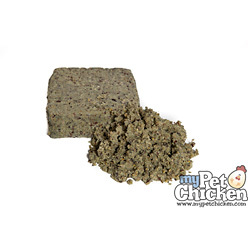 The Optimal ForageCake–also available on our website–is a great suet cake for chickens, too. Remember, you can also make your own suet cakes. We have a great recipe for DIY suet cakes for chickens in our book. Do you cook for your chickens? You can find more recipes for them—including a crustless pumpkin pie, and even refreshing summer recipes like a Waldorf Salad for chickens—in our book, the My Pet Chicken Handbook. You can get a signed copy by going to our home page in the top navigation menu above–or you can find it on Amazon, Barnes and Noble, etc. I have tried oatmeal and bread. I also use pasta, my chickens love it. When I dump it out in the coop the coop steams up and the chickens start going crazy and getting defensive with each other because each and very one of them in trying to have it all to themselves. I had a lovely, little Rhode Island Red Hen named Daisy for five and half years. I adopted her when she was one day old. She was my pet. She never lived outside. She was a “house chicken”. She slept on soft blankets in a corner of my kitchen. She would watch television with us in the family room. She sat on our laps (like a puppy). She LOVED Walmart hamburgers, and only if they were made on the grill! My yard is over an acre and has many small bushes and low hanging trees. Daisy loved to “dust” under these, and with the yard so big, sometimes I didn’t know where she was, so in order to not have to walk the entire yard, I would go out on our deck and take the cover off our grill pretending I was going to make burgers. Within 30 seconds Daisy would be up the four deck steps standing beside me looking longingly at the grill – so hopeful for a burger. She would always look so heart broken when she realized it was just a ploy to find her. She really loved those burgers – and she always seemed to know when it wasn’t Walmart ground beef. She actually would refuse to eat it! She was so smart, and so sweet! sunflower seeds. They are in henny heaven!! !